Stefan Lubomirski de Vaux started taking photos at the age of eight. His first camera was a Kodak brownie that had just two settings – sun and cloud. Captivated by the results, lubo later learned how to print his own shots and went on to run the photography club at Ampleforth College. While continuing to indulge in his passion for photography, lubo successfully completed a Civil Engineering degree and a Masters in Bridge Engineering and subsequently enjoyed a successful and varied business life. Initially working as a Civil Engineer, lubo went on to do an MBA at Cranfield, became a property developer, project manager and consultant for private healthcare and the NHS (which included taking four hospitals from concept to completion) and founded an Internet consultancy. During this time, lubo kept taking photos and held several photography exhibitions. He was also commissioned by Foxtons to take photographs of a series of articles for their magazine about celebrities and their homes. 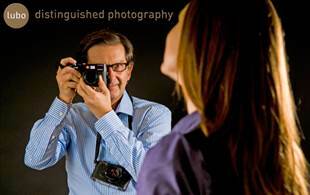 In 2006 lubo sold his internet business and turned to his lifelong hobby and passion – photography. http://www.stefanlubo.com Now his full time profession, photography has taken him all over the world and given him access to extraordinary people, from the British Royal Family to the bushmen of Africa. Working on location at home, abroad, or in a studio, your project may be as simple as a one day session – or may take anything up to a year or more. Lubo’s style of photography lends itself well to story telling – so whether your story is short or long, he’ll create for you a modern masterpiece. His unique vision casts objects in a new light, giving you a deeper appreciation of them. Working with charm and expertise, he delivers picture perfect portraits; intimate images of your precious possessions; and timeless mementoes of your beloved places. Portraiture – in the studio, home or on locationSample commission: A week spent with the !Gubi family of San Bushmen in the Kalahari Desert, Namibia, for a skin care company based in South Africa. Architecture and interiors, landscape and estate photography – including reportage recording of social, sporting and business events. Sample commission: ‘A year in the life of a Scottish Estate’, 800 beautiful images compiled into a 400 page book. Objects of desire including paintings, sculptures, bibelots and Objets d’Art, cars, yachts, private jets and personal collections. Sample commission: Photographing an extensive private art collection in Geneva that included Old Masters, Cartier jewellery, bibelots such as netsuke and antique and modern furniture. Lubo also works with businesses and takes head shots and portraits for corporate websites, reports and PR material – and his event work covers product launches, AGMs and award ceremonies.